^ a b c d e f g h i j k Quintana, E. V.; Barclay, T.; Raymond, S. N.; Rowe, J. F.; Bolmont, E.; Caldwell, D. A.; Howell, S. B.; Kane, S. R. et al. (2014). “An Earth-Sized Planet in the Habitable Zone of a Cool Star”. Science 344 (6181): 277–280. doi:10.1126/science.1249403. ISSN 0036-8075. ^ a b c d Bolmont, Emeline; Raymond, Sean N.; von Paris, Philip; Selsis, Franck; Hersant, Franck; Quintana, Elisa V.; Barclay, Thomas (Submitted 16 April 2014). Formation, tidal evolution and habitability of the Kepler-186 system. 1404. arXiv. p. 4368. arXiv:1404.4368. Bibcode: 2014arXiv1404.4368B. http://arxiv.org/abs/1404.4368. ^ Staff (2014年3月16日). “EBI – Search for Life Beyond the Solar System 2014 – Exoplanets, Biosignatures & Instruments”. EBI2014. 2014年4月21日閲覧。 See session 19 March 2014 – Wednesday 11:50–12:10 – Thomas Barclay: The first Earth-sized habitable zone exoplanets. ^ Rowe, Jason F.; et. al (27 February 2014). “Validation of Kepler's Multiple Planet Candidates. III: Light Curve Analysis & Announcement of Hundreds of New Multi-planet Systems (Revision 8.0)” (PDF). Astrophysics; Earth and Planetary Astrophysics (arXiv): 45. arXiv:1402.6534. http://arxiv.org/pdf/1402.6534.pdf 2014年4月18日閲覧。. ^ Glister, Paul (2013年11月5日). 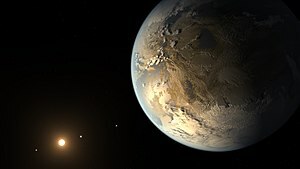 “Earth-Sized Planets in Habitable Zone Common”. Centauri Dreams. 2014年4月21日閲覧。 See comment by "Holger 16 November 2013 at 14:21". ^ Bovaird, Timothy; Lineweaver, Charles H. (1 August 2013). “Exoplanet Predictions Based on the Generalised Titius-Bode Relation” (PDF). Astrophysics; Earth and Planetary Astrophysics (arXiv) 435 (2): 14–15. arXiv:1304.3341. Bibcode: 2013MNRAS.435.1126B. doi:10.1093/mnras/stt1357. http://arxiv.org/pdf/1304.3341.pdf 2014年4月18日閲覧。. ^ Lammer, H.; Stökl, A.; Erkaev, N.V.; Dorfi, E.A. ; Odert, P.; Güdel, M.; Kulikov, Yu.N. ; Kislyakova, K.G. et al. (Submitted 13 January 2014). Origin and Loss of nebula-captured hydrogen envelopes from "sub"- to "super-Earths" in the habitable zone of Sun-like stars. 1401. arXiv. p. 2765. arXiv:1401.2765. http://arxiv.org/abs/1401.2765.